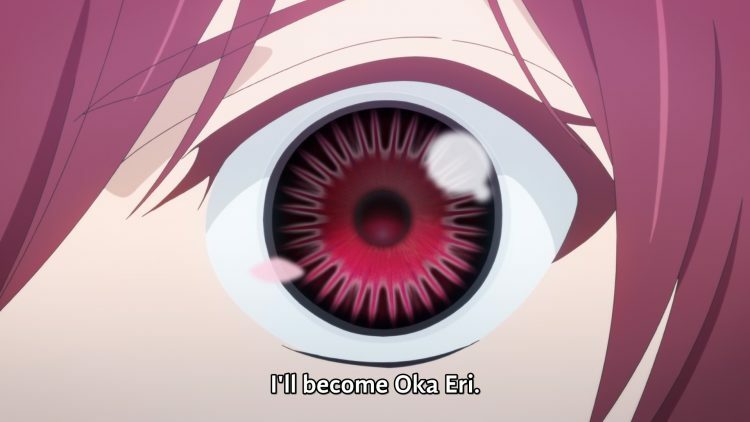 Oka Eri—formerly Fujikawa Eri, one year Asai Kei’s junior, and antagonist of the arc—has seen Kei as a villainous figure for the past two years. In middle school, Eri was a timid girl who Kei pushed into blackmailing her abusive father in order to force him out of her and her mother’s life. That little prodding was the end of Kei’s involvement in Eri’s personal life; however, it served as the impetus for a complete change in how she acted and presented herself. She adopted a red-and-black punk aesthetic, complete with matching colored contacts, and modeled her new “Oka Eri” persona after the villain who had drawn it out of her. When Eri reconnects with Kei a couple years later, she’s dismayed at what he’s become. He’s a far cry from the villain she remembered him to be. He’s grown past his old methods, and he believes he could have handled the situation better, without forcing her to be solely responsible for breaking up her family. But Eri won’t have any of that. She likes who she’s become. She’s proud of the decision she made. And it infuriates her to see that her model villain’s gone soft. Eri doesn’t have the full picture, though—she doesn’t realize that Kei was just using her to gather information on her father, who had ties to the Bureau. She doesn’t realize that he came into her life shortly after Souma Sumire’s death, and that at the time, he wasn’t in a good place either. All she saw was this older guy swoop in with all the answers to her problems, and now she feels utterly betrayed—like the last two years of her life were a lie. Oka Eri’s image of Kei is flawed and incomplete, based on a handful of encounters at a very specific point in his life. So it’s fitting that her power would allow her to alter others’ memories, manipulating them into acting based on false ideas, when that serves as the foundation of her entire persona. So Eri challenges Kei to a contest to settle things with him once and for all. To prove to herself that she’s strong, that she was right to abandon the Fujikawa name and become Oka Eri. That he’s not worth her time anymore, and she can go on being her new self. Kei’s not interested in a fight, though, so he readily offers her the MacGuffin when she proclaims her intent to steal it. Mere surrender isn’t good enough, though—Eri won’t be satisfied unless she actually defeats him, but she ultimately fails to even convince him to fight, and their aborted conflict results in her deciding to target the woman with the most powerful ability in Sakurada, known only as the Witch. The Witch is an elderly woman, stripped of her name and living in captivity in service of the Bureau, where she’s been for almost thirty years. She has the ability to see the future, which the organization uses to predict and prevent trouble occurring within the city. Before her confinement, the Witch was romantically involved with a man named Sasano Hiroyuki, whose ability allows him to recreate the world captured in photographs he’s taken. Being able to see the future, the Witch knows that her death is imminent, and she’s orchestrated a plan to escape, taking advantage of Oka Eri’s disillusionment with Asai Kei. The Witch fears that, after three decades apart, her love for Sasano may exist only in the past—her memories with him nothing more than a stone meticulously polished in the currents of time. And she wants to reaffirm her ability to love the man he is now, not merely what she remembers him to be from long ago, before she passes away. Sasano, meanwhile, possesses a direct window into the past through his photographs. He spends his days basking in nostalgia, frequently revisiting the sakura tree in his yard at a time back when it still bloomed strong. Sasano’s heart too is trapped in the wistful beauty of his past, reliving fragmented, carefully selected memories. In the same way, his power also allows him to visit with recreations of his love as she was before being imprisoned. He’s able to cooperate with these snapshots of the nameless Witch—still able to see the future—to aid in her plan so they can reunite and spend their final days together. To crawl out from under the shadow of their past and live and love in the present. After a few complications and some slight assistance from Kei, Haruki, and Murase, the Witch manages successfully escape confinement. And now that she’s free, she plans to leave Sakurada together with Sasano—but not before leaving Kei with a little parting gift: the knowledge that even with his perfect memory, he’s as vulnerable to holding on to idyllic images of the past as anyone else. hello, you don´t have the image of the eye whitout the subtitle? i need it :c, please.